Speed: 28 Pages per Minute. Max Duty Cycle: 50,000 Month. Printer Resolution: 1,200 x 1,200 dpi Quality. 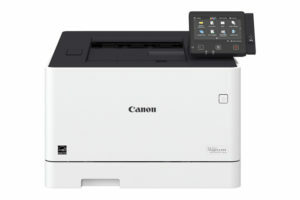 Mobile Print: Apple AirPrint, Canon PRINT Business, Mopria Print. First- Print Time: Approx.9 Seconds (Letter). Toner Yield: B&W 6,300 Hi-Capacity @ 5% Coverage. Cloud Services available on select models.